Commercial fences are designed for security-to keep out intruders or keep in residents of facilities or livestock. They are typically heavier by design in both height and size of the components to make them hold up the abuses of a commercial site and make it harder to infiltrate. 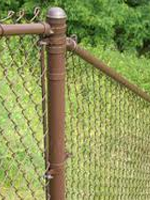 The most basic commercial fence style is chain link. It is available in traditional galvanized (silver-grey colored), or for a less industrial look, black, brown or green color where the wire is covered with thermally bonded colored vinyl and the posts and fitting are powder coated. Another popular commercial fence style is ornamental aluminum or steel. We can use the same lighter weight products that we would install in a backyard, but commercial customers normally opt for a heavier grade with oversized fence components. All of the styles that are available in residential grade can be built in various heavier sizes all the way up to the industrial grade that is used at schools, stadiums, and airports. Heavy gates that provide very wide openings to accommodate the largest vehicles are often included in a commercial fence layout. We can install single or double; swinging, rolling or sliding gates and all can be equipped with automatic gate operators. They are available in chain link, ornamental steel or aluminum and even wood faced on reinforced frames. Gate operators are low voltage motorized systems that will open a gate from a remote control in your car, home or office. They can also be activated from a key pad or telephone intercom outside the gate. We always include safety features to keep the gate from closing on a vehicle or pedestrian. We can also add a “free exit” that automatically opens the gate as a vehicle approaches from inside. A “Knox Switch” allows access for emergency vehicles.